You may been hearing more and more about pervious concrete lately. 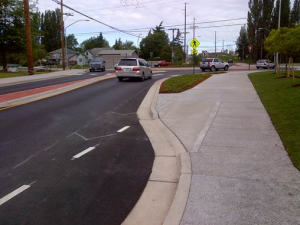 This environmentally friendly paving surface is being embraced more and more as folks all over the region — from Bellingham homeowners to Monroe city managers — experience its benefits. Pervious concrete can reduce rainwater runoff, improve lot drainage and even qualify for LEED benefits. If you want to see pervious concrete in action yourself, the fall (with its increase in rain) is a great time to do it. 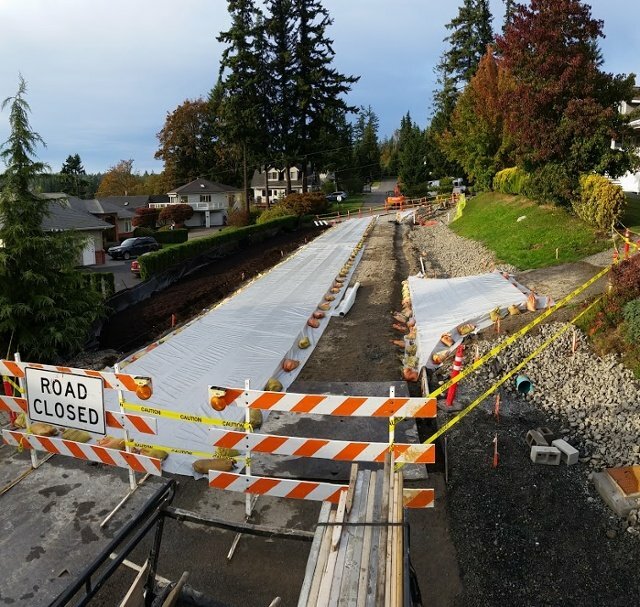 Here are a few pervious pavement projects that Custom Concrete has installed over the years near Bellingham in Whatcom County (with one bonus down in Anacortes). 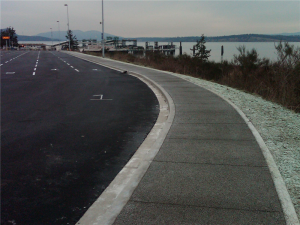 The Washington State Ferries Anacortes Ferry Terminal: When work was done recently to upgrade the ferry terminal in Anacortes, Custom Concrete went down and installed pervious sidewalks around the car waiting and queuing area. The result is a beautiful, durable path that provides a great walking area without adding another impenetrable surface that creates runoff. Hop out of the car and check out the pervious sidewalks the next time you’re waiting for a ferry to Friday Harbor. Huntington Street: Custom Concrete turned a gravel road in the Lake Whatcom watershed into a beautiful pervious concrete street designed to limit the amount of phosphorous flowing into the lake. Since Lake Whatcom is Bellingham’s reservoir for drinking water, reducing the flow of any pollutants into the lake is a great thing—and pervious concrete helps make that happen. Bloedel Donovan Park: This large Bellingham jewel is also located in the Lake Whatcom watershed, and as such anything that helps reduce runoff is a good thing. Custom Concrete replaced traditional concrete walkways in the park with pervious concrete paths designed to allow rainwater to filter right into the ground instead of coursing its way straight into the drinking supply. Northwest Avenue and McLeod Road: Not only did the roundabout at Northwest and McLeod add safety to a busy intersection full of traffic headed to town, to I-5 and to Bakerview Road, but it also added environmental sustainability, too. The sidewalks there are made of pervious concrete, allowing rainwater to filter through into the ground beneath instead of flowing into the street itself. Barkley Village area: When it came time to improve a hard-packed path worn between two neighborhoods in the Barkley area of east Bellingham, Custom Concrete was called on to install a new permeable concrete sidewalk. In all, CCC placed 164 feet of pervious path to connect these two communities. Sounds like an environmentally and community friendly win, right? For more information on pervious concrete and how it can benefit your next project in the community, give Custom Concrete a call.